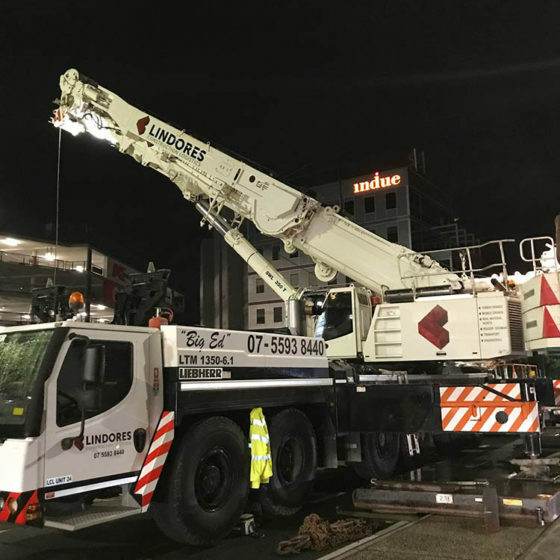 Lindores Construction Logistics is a family owned and operated tower crane and mobile crane hire and maintenance company. 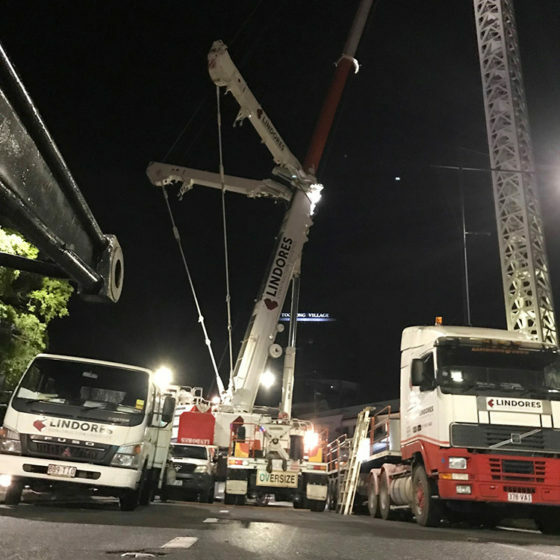 Having a vast knowledge of the industry and what it requires to be an energetic subcontractor in the Building Industry has given us a reputation as one of the best. 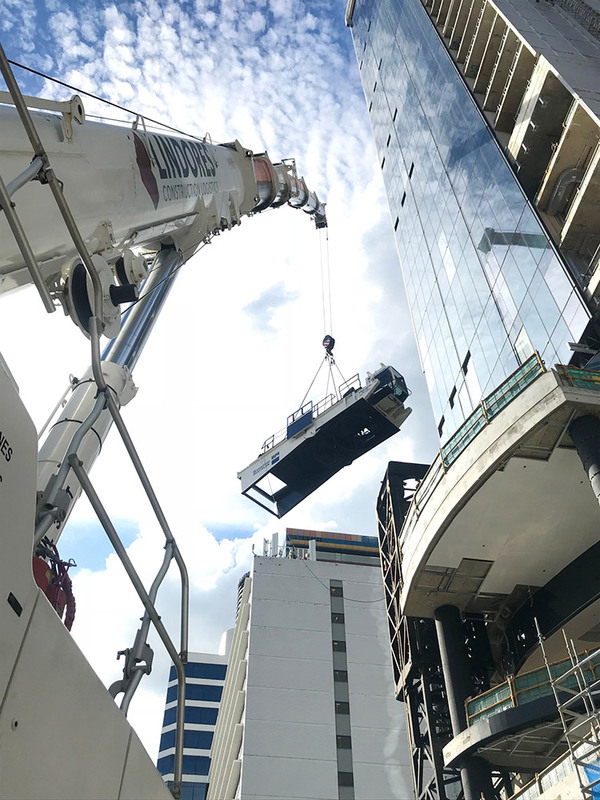 LC Logistics strives in understanding what people want and thinking outside of the box when it comes to intricate projects involving a high level of commitment, team work and enthusiasm to get the job done, on time and on budget with a high priority for safety. 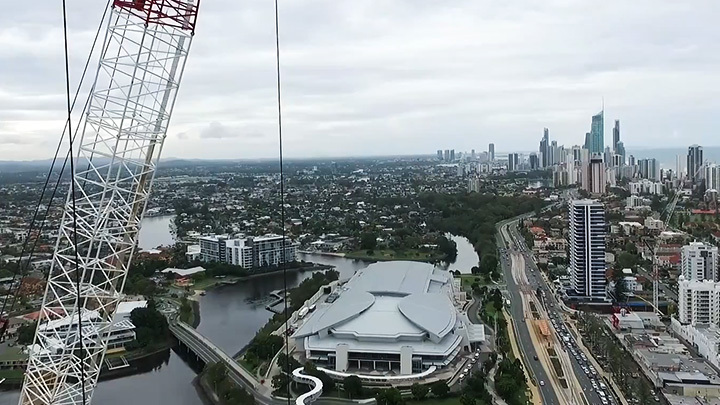 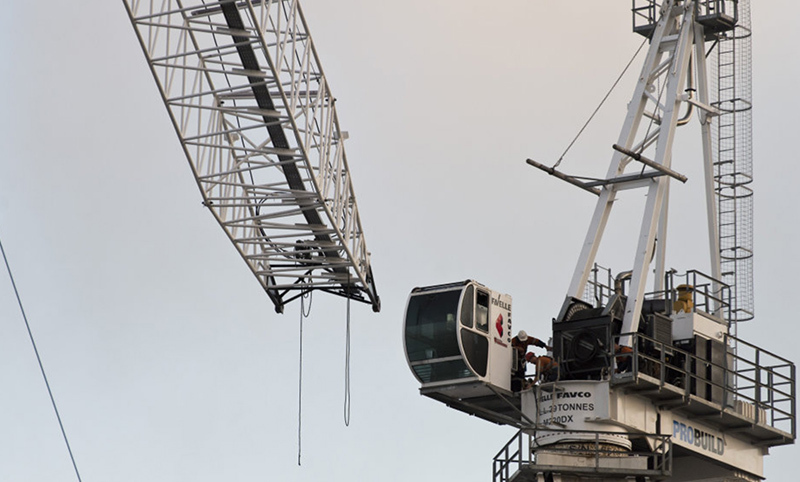 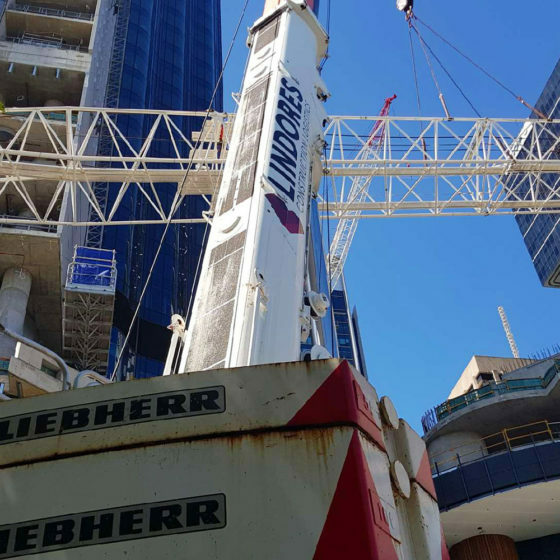 For crane hire on the Gold Coast, Brisbane, and Queensland contact LCL today on 07 5593 8440. 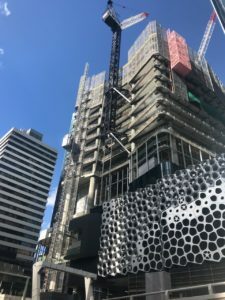 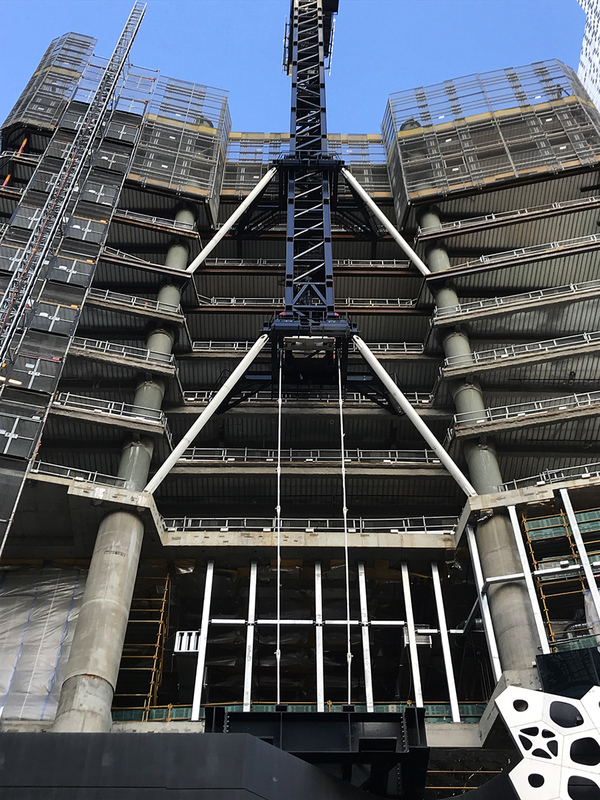 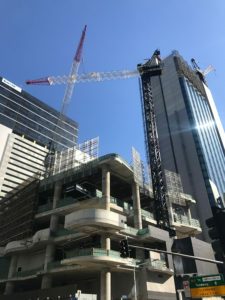 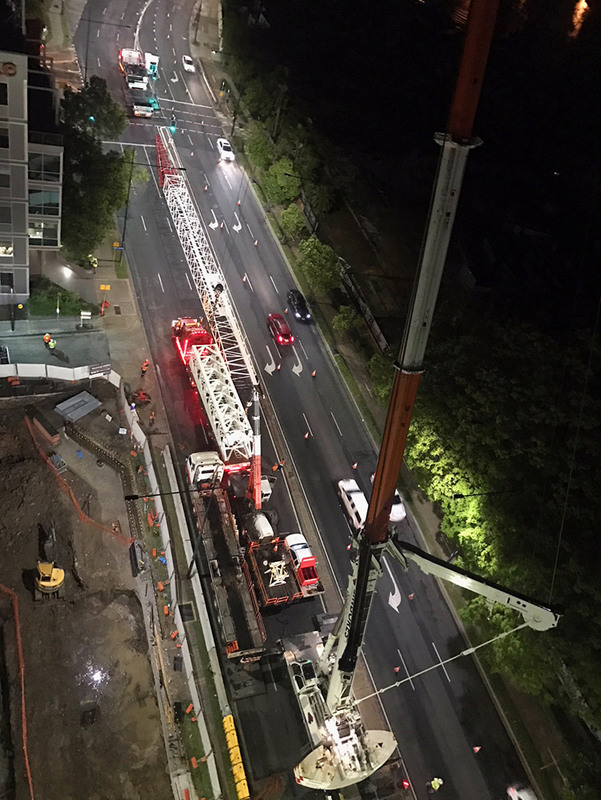 TC5 300 George Street, Brisbane was installed on a cantilevered grillage (iron girders attached to the inside of the building) to anchor the crane in the inside of the building so that when it climbs up the building the lower floors can be completed. 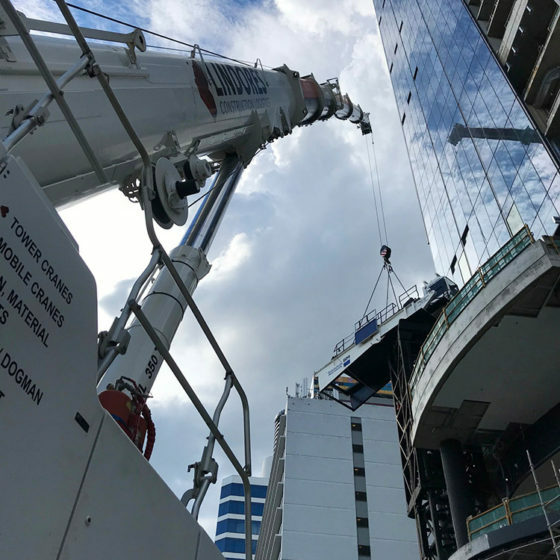 The crane was added after 4 floors had been completed and once the structure had reached level 13 the two sets of external ties were fitted to the crane and structure. 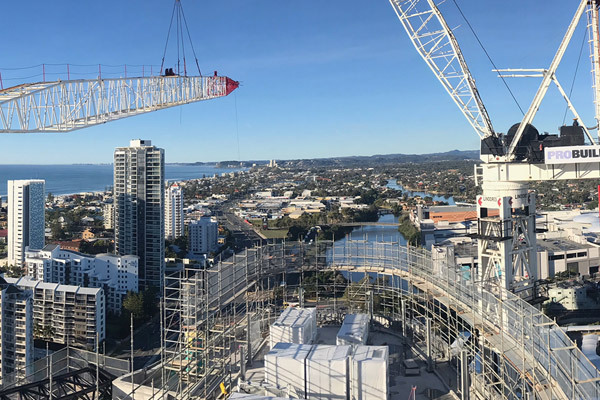 The cranes climbing ladders were then installed to the lower crane tie and from there the crane was balanced and climbed itself and the 12 towers off the cantilevered grillage 20m to then sit on the bottom tie structure on level 8. 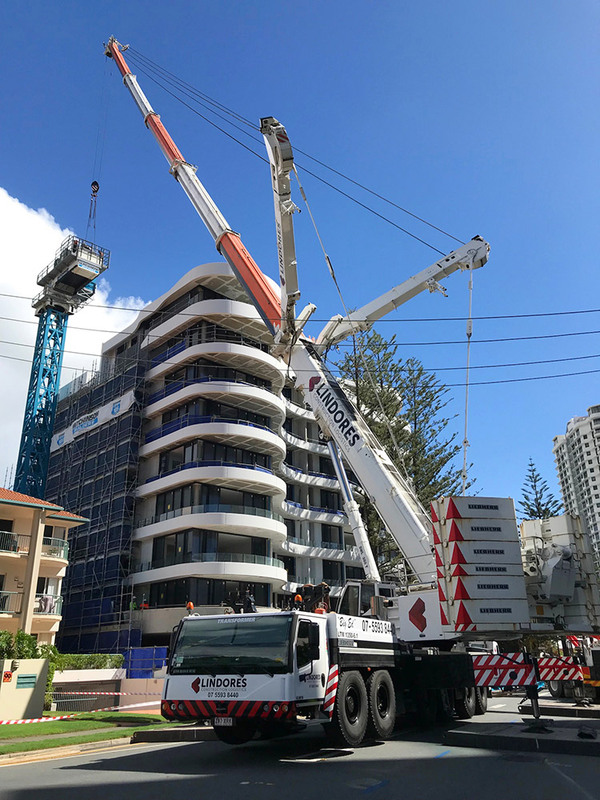 The crane is now sitting 20m higher than initial install and the crane will climb itself up another 150m through 7 climbs to finish the building. 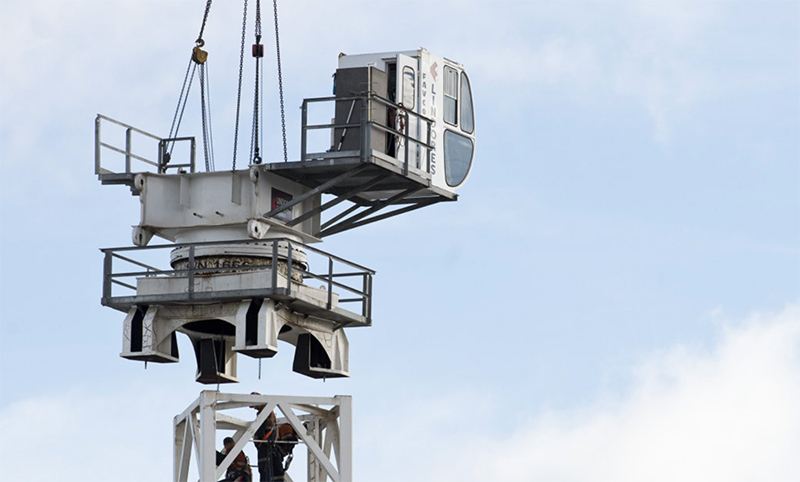 Congratulations to everyone involved in the design, installation and successful first climb on Sunday 6/05 of TC5. 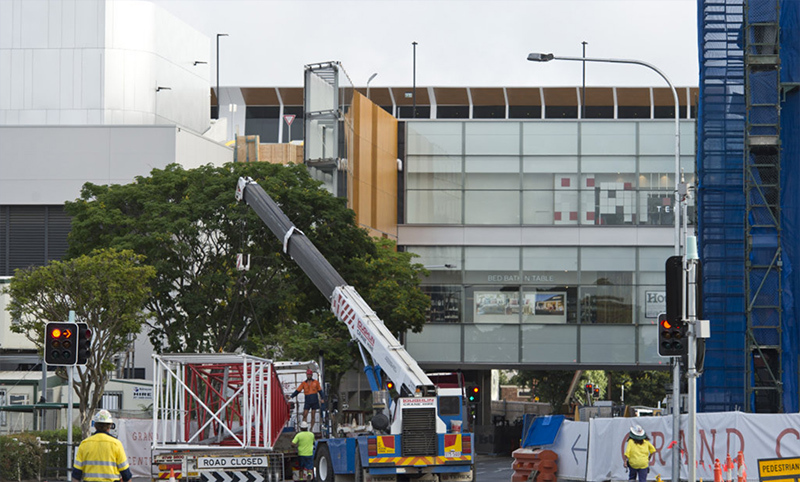 Visit our George Street project page for more details. 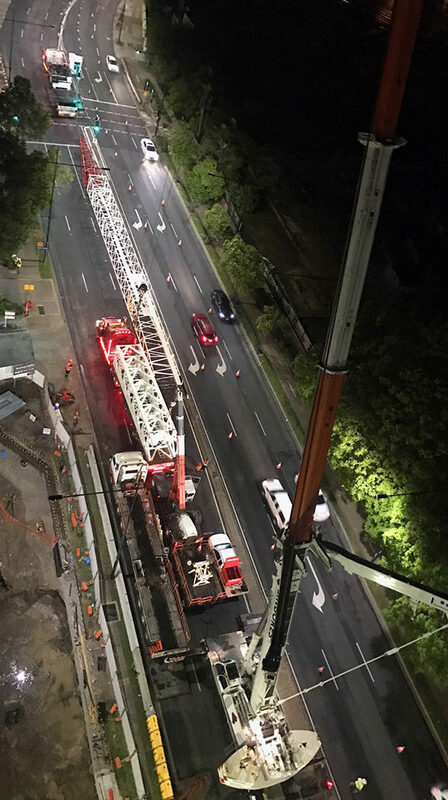 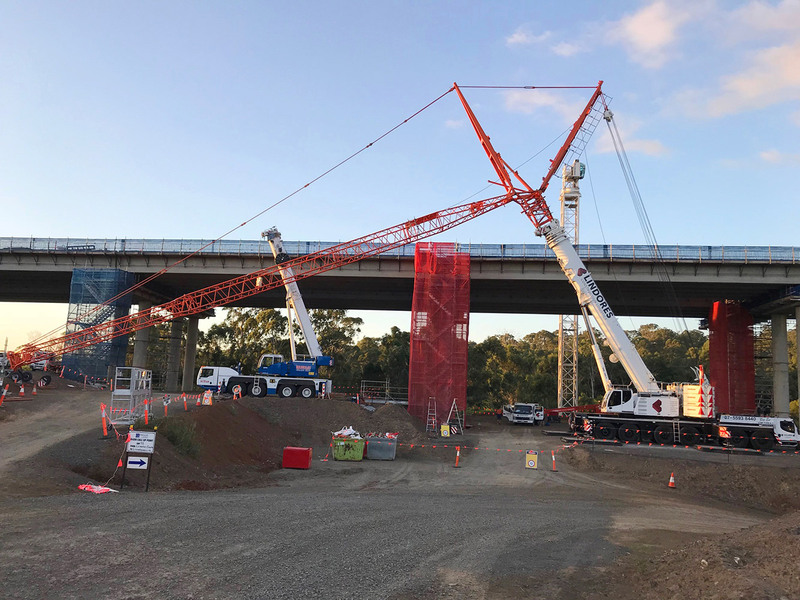 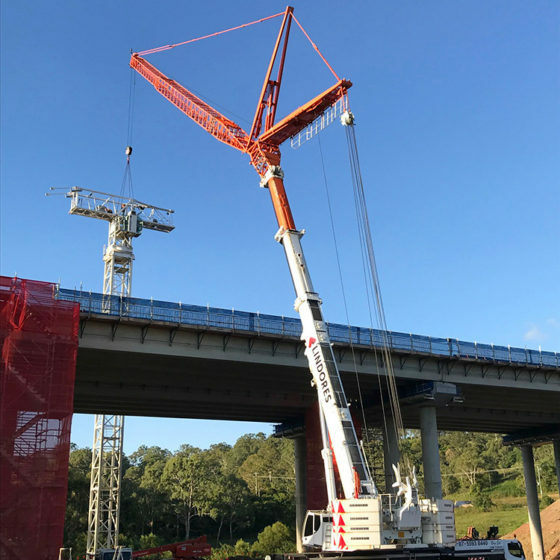 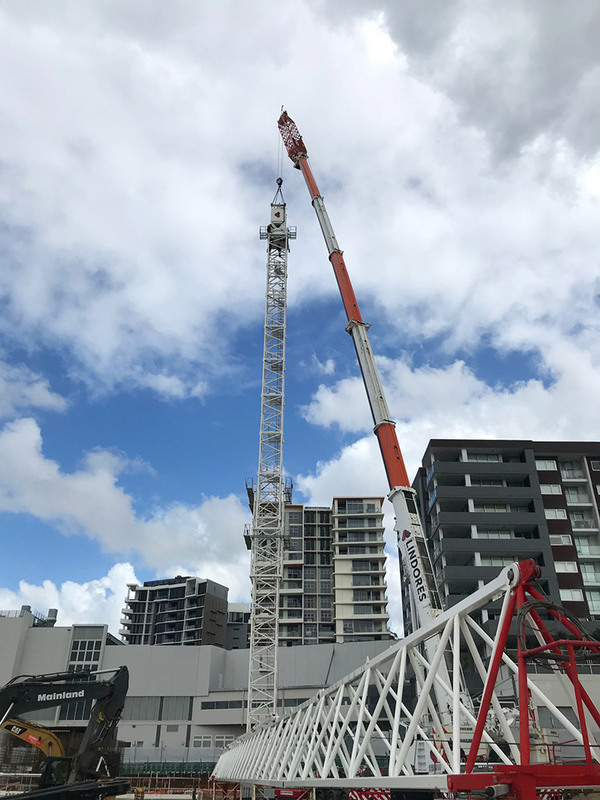 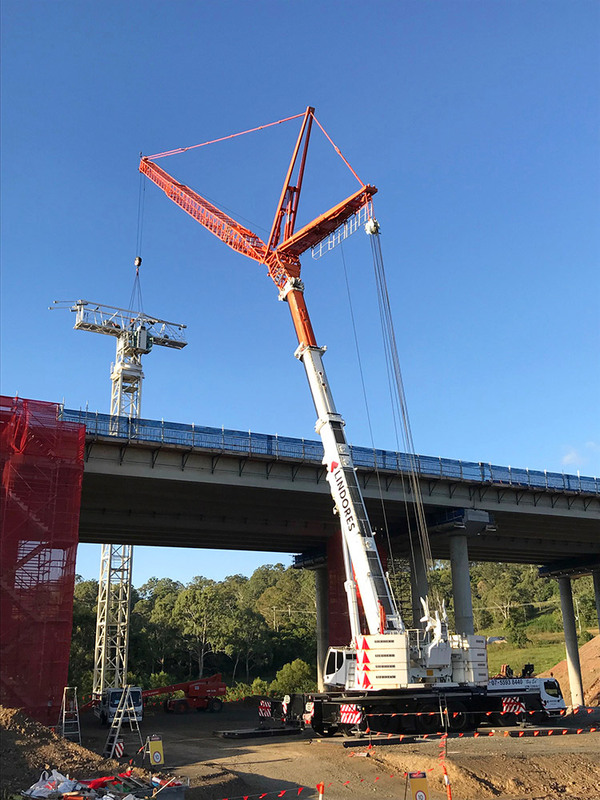 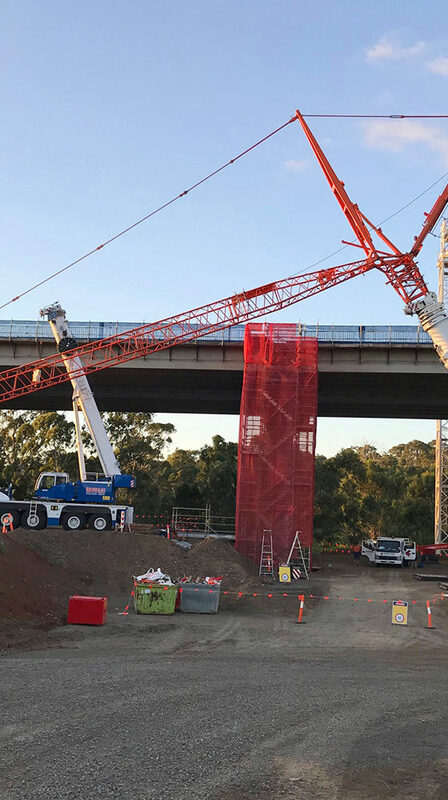 Recently LCL purchased a Leibherr LTM 350 to assist in the erection and dismantles of tower cranes throughout Southeast Queensland. 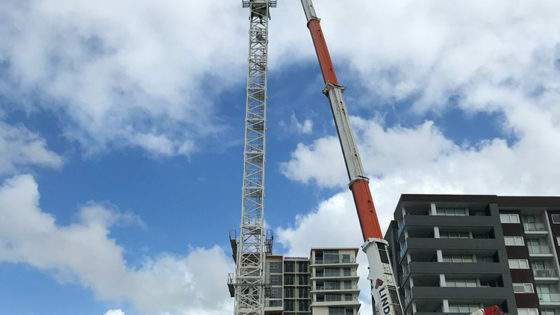 All though that will not be this cranes only purpose we have been approached by multiple companies to look at heavy lift jobs and lifts over 100m in height such as bridge beams, large switchboards and air conditioning replacements in high rises in Brisbane’s CBD. 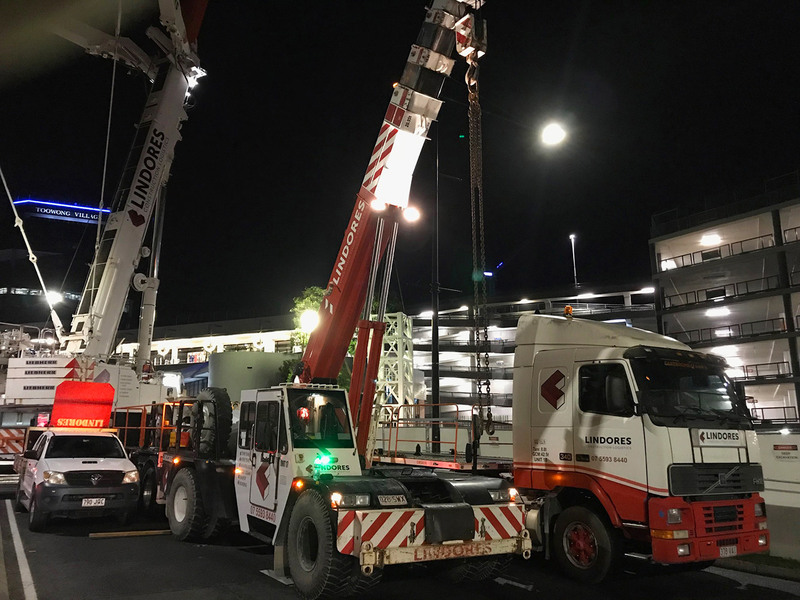 Due to the cranes versatility, quick set up and pack up procedure and the amount of different configurations the crane is capable of doing makes difficult jobs an easy to reach project for this machine. 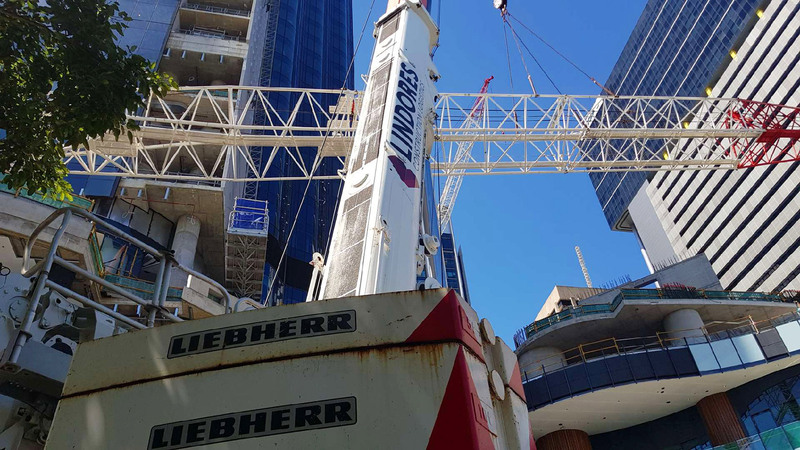 Recently Lindores Construction Logistics was featured on the Chronicle’s website as its last tower crane was removed from the Grand Central redevelopment site. 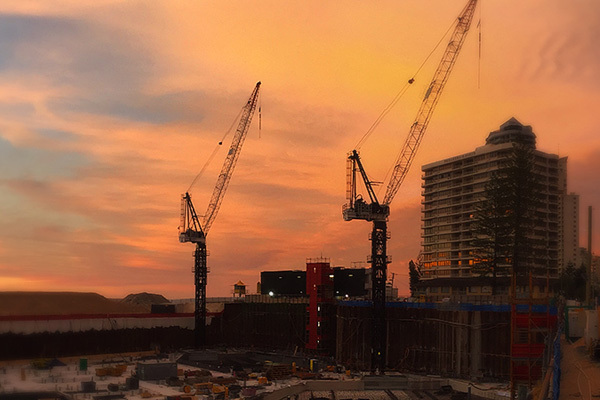 At the peak of construction there were 5 tower cranes in operation for the $500 million redevelopment. 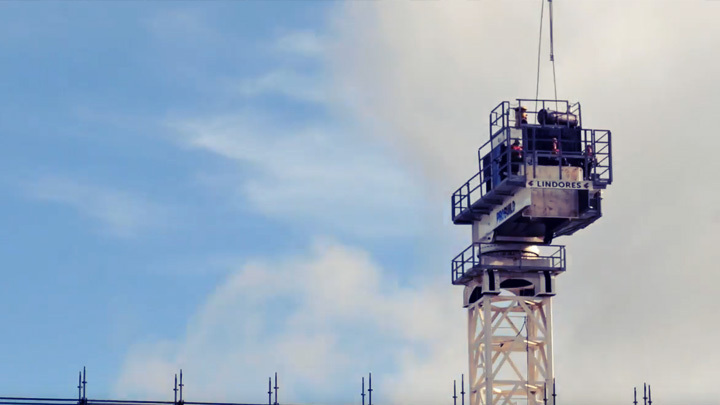 Watch the dismantle video below. 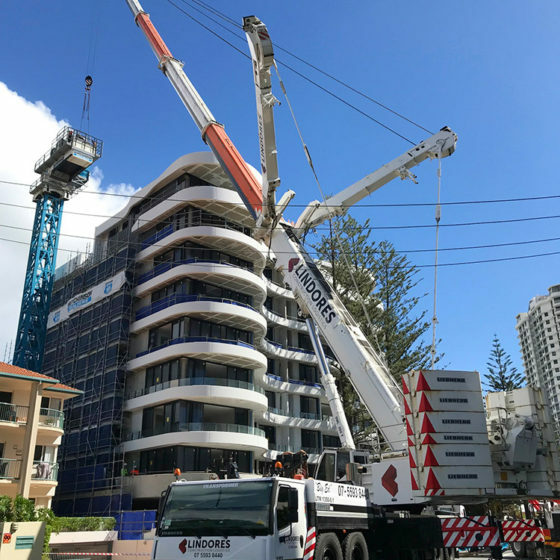 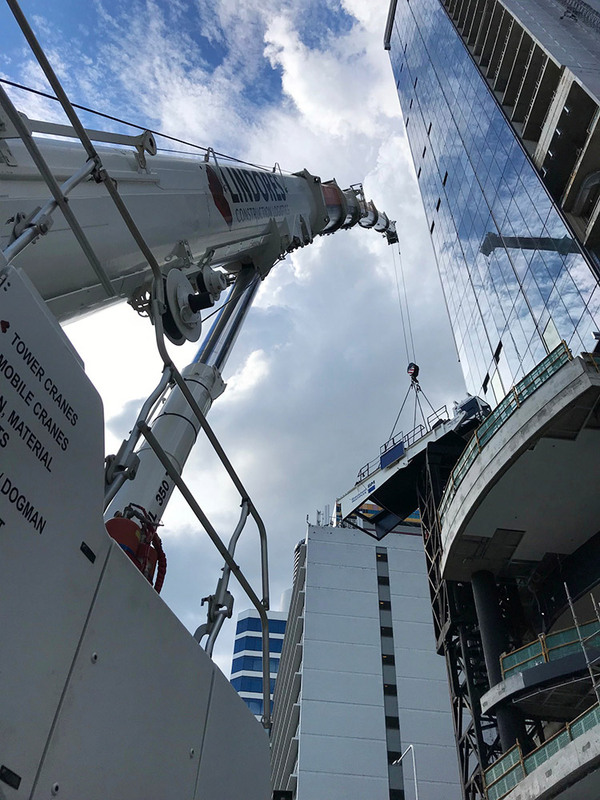 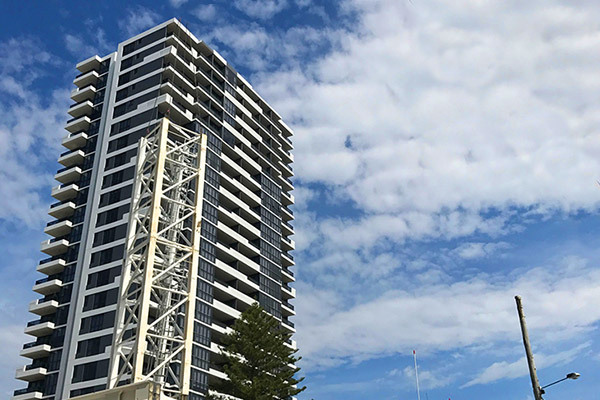 Lindores Construction Logistics is proud to be part of the development of a new Hotel Suite attached to one of the Gold Coast’s most iconic venues – Conrad Jupiter’s Casino. 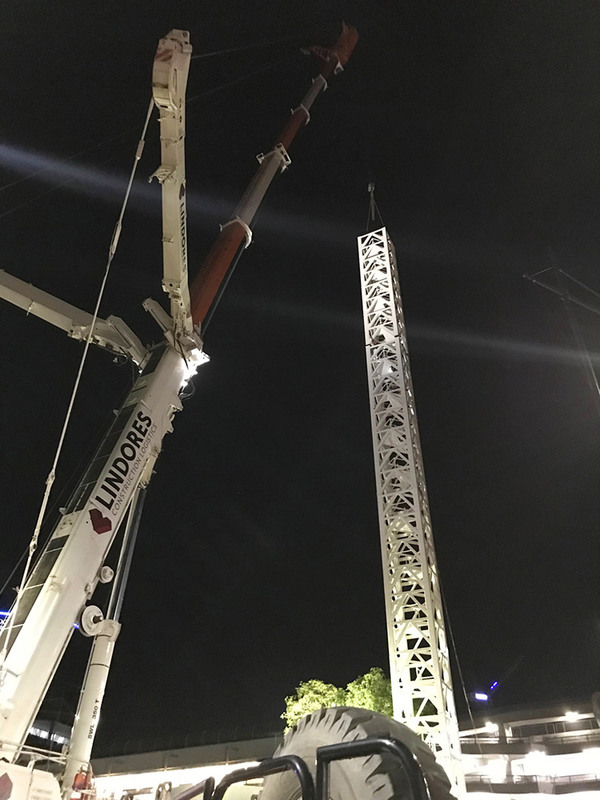 In this video we operated dual cranes to lift multiple steel sections to the top of the tower. 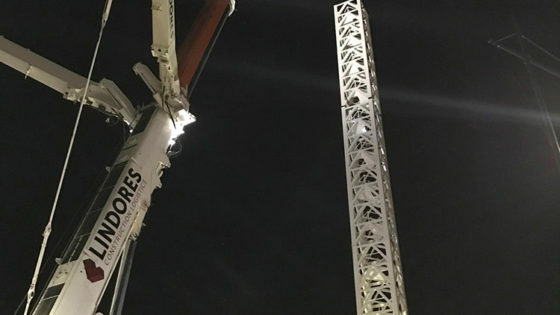 Follow us on Facebook or Youtube to stay up to date. 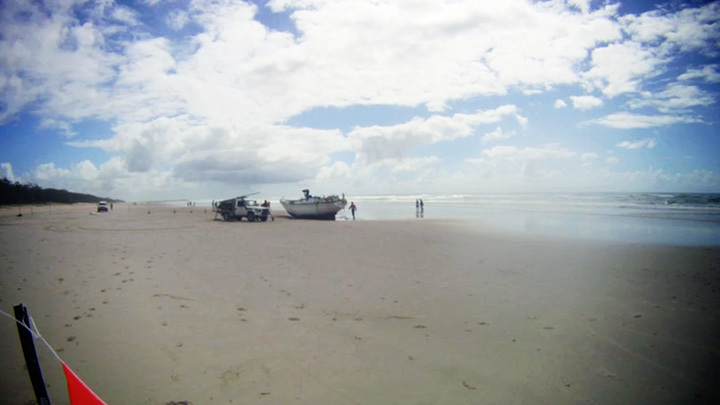 After 5 months lost at sea the Scotch Bonnet washed up on a Queensland shore. 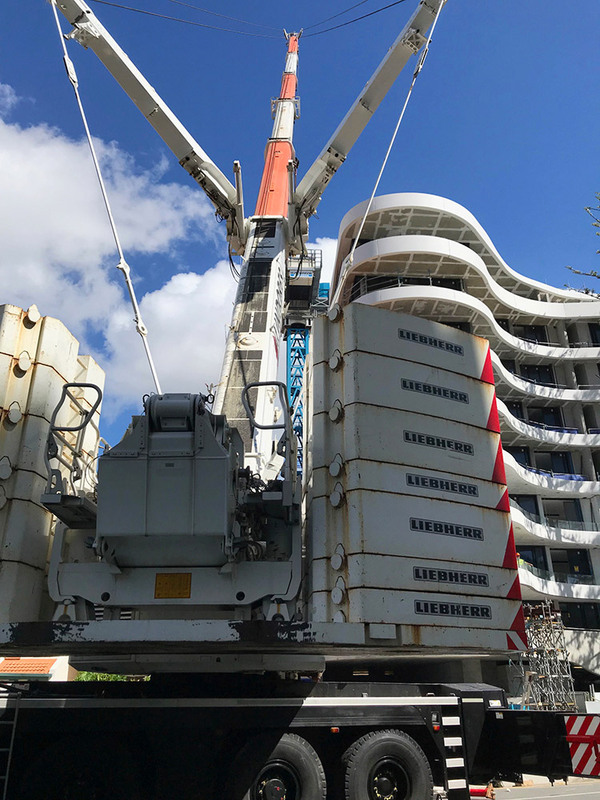 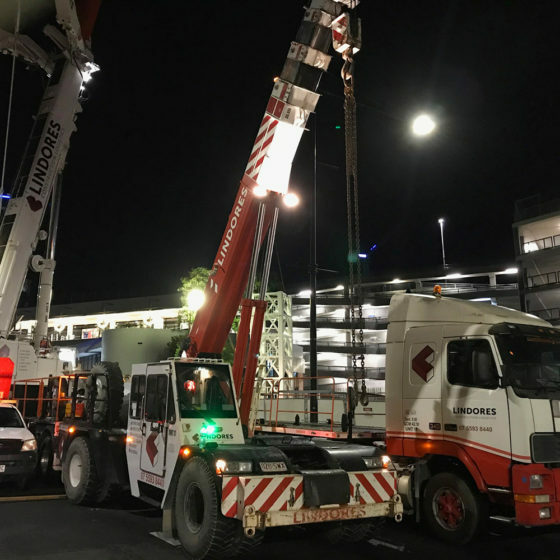 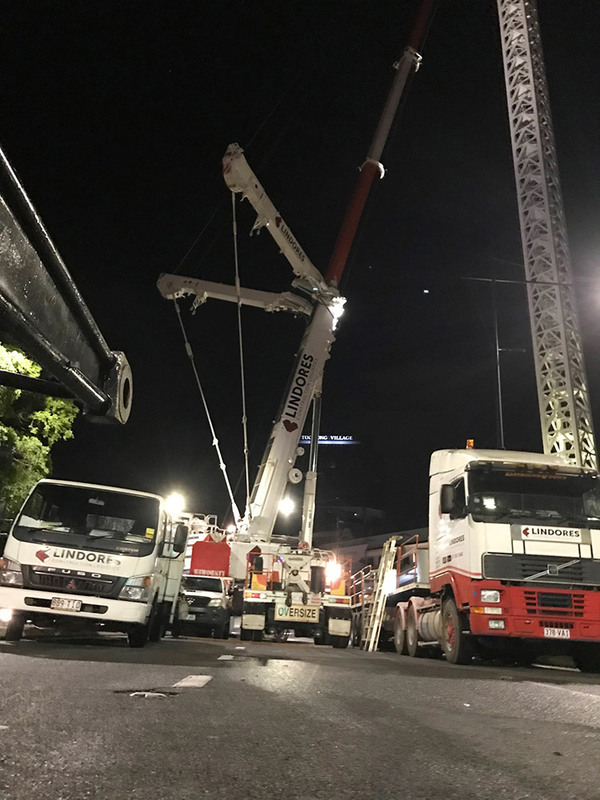 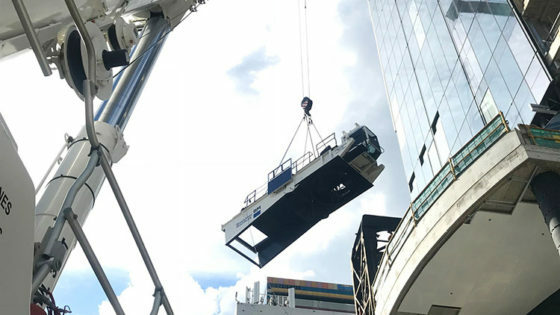 LC Logistics worked with Marine Civil Contractors, using two of their mobile cranes to bring the boat up to the street where it could be removed by truck. 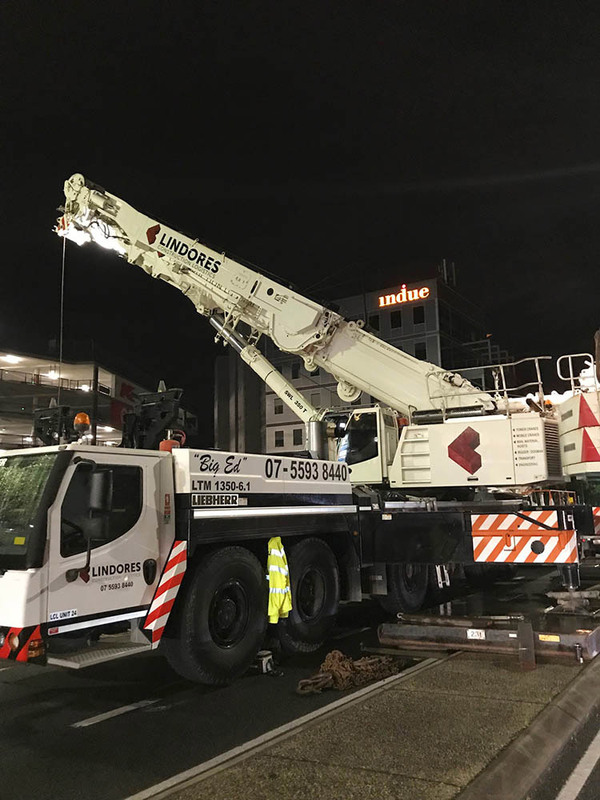 This operation proved the diversity of service that Lindores Construction Logistics was able to provide and the flexibility of their mobile crane unit. 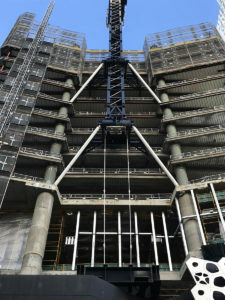 MPX 300 George St Project. 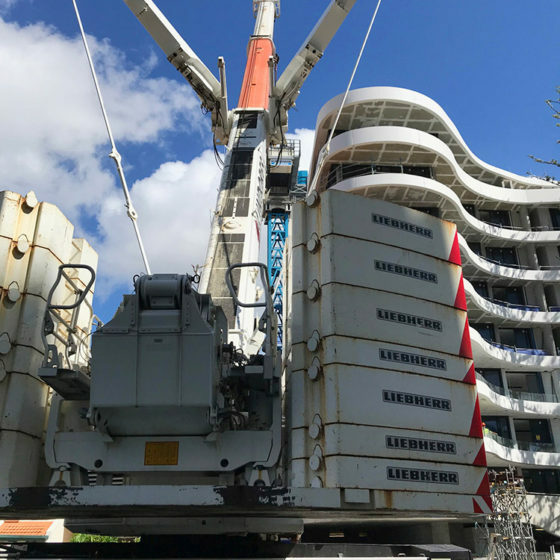 Massive Achievement for the rigging crew dismantling an M120RX on 26 Towers, ext climbing frame, 3 x chocks and a Grillage to Re-install an M390D onto and internal climbing set-up with another 2x climbing chocks 12 Towers and..
LC Logistics is always looking to expand our experienced and knowledgable team. 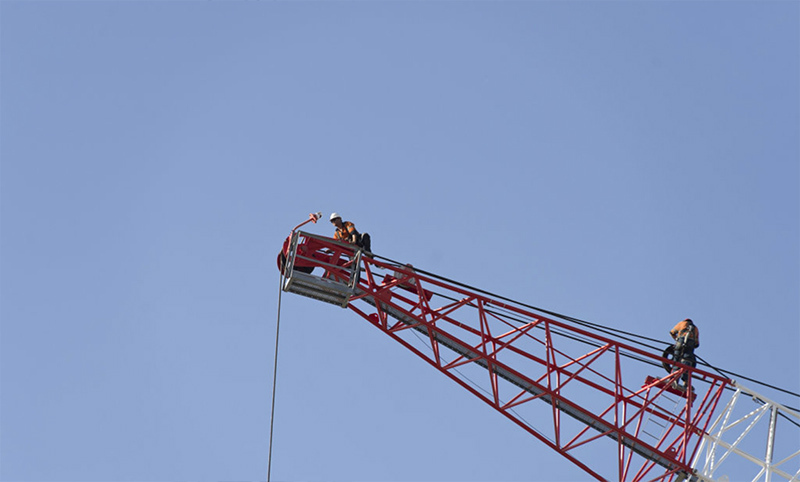 If you’re interested in learning more, check out our careers page for more information.